It is the gentle giants of the jungle, the orangutans, which are the main attraction here. Bukit Lawang is one of the best places in the world to meet this rare and endangered primate. 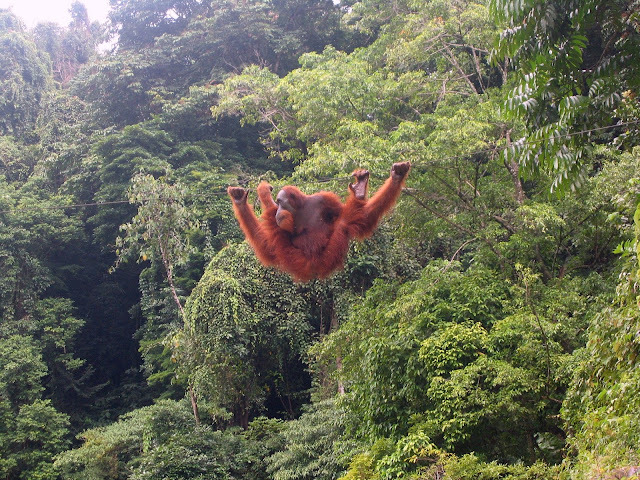 See these graceful creatures swing through the forest canopy as they forage for fruit. This is one of the largest stronghold communities of orangutans, with more than 5000 of them living in the here. The Orangutan rehabilitation center is where young orphaned orangutans are trained to live in the wild and has been operating since 1973. Today, it attracts visitors from around the world who come here to catch a glimpse of these amazing orphaned creatures. The rehabilitation center helps orangutans regain their natural habits by putting them through intensive training before their release back to the wild. Once a primate heads back the jungle, the rehabilitation center keeps providing it with food supplements and regular check-ups. As you venture deep into the Sumatran jungle, you’ll have little way to get around but to use your feet and walk. Trek through the wild and muddy jungle and try and catch a glimpse of the native wildlife. The park is home to Sumatra’s and the world’s most exotic animals including elephants, tigers, sun bears, gibbons clouded leopards as well as the famous orangutans. Hike the hills for some incredible views of the spectacular landscape. For a true adventure go rafting and ride the wild rapids of the river. From Medan use a car or a bus to get to Bukit Lawang. Buses depart frequently from Pinang Baris bus terminals (located at Jalan Gatot Subroto). The trip takes around 3 hours. If you are traveling in a group or want something more convenient instead of the public bus, you can rent a car with arranged trips through most of the main tourist destinations. Using Car Rental 8 you can find affordable car rentals from over 50,000 international locations.